Urban Decay, a cosmetics company based in America and later on pervading the whole Europe and Asia, literally decayed the urban life, offering to replace the conventional and typical beige and brown lipstick shades and nail polishes with M&M’s bold and vibrant colors. And soon the urban fashion-conscious girls could be seen strolling around the city with fuchsia pink lips, emerald green fingernails or scarlet red eyelids, breaking all the molds in the fashion world. Now in 2015 we take it as a matter of course to see such a funny festival of colors, but 20 years ago this was a real cannonade and definitely the alpha of color raining process. And if you again spot that purple paw print on your Urban Decay product, just recall the company’s “Marley approved’ vegan dogma and keep on enjoying those sweet goodies with a clean and untroubled conscience. It was not long ago that the cosmetics brand spread the word about its cool and chilly collaboration with the American singer, songwriter, fashion designer, Harajuku Lovers style originator and famous beauty junky ” Gwen Stefani. Actually, there couldn’t be a better personality for Urban Decay to collaborate with. It is just enough to bring to mind the Jezebel’s vibrant red lips so ideally going with blonde hair, her unique and unforgettable experimentations with that very blonde hair and, of course, her energetic and somewhat aggressive compositions. And finally today the brand has decided to unveil the new Urban Decay Gwen Stefani eyeshadow palette on its Instagram account thus giving us an opportunity to enjoy an alluring and magnetic result of long discussions, creative ideas and deft hands of extravagant Gwen Stefani and Urban Decay’s creative director Wende Zomnir. Given that the talented singer is a true blue pursuer of bold and vibrant colors, it is natural that we were expecting to see a brighter eyeshadow palette. 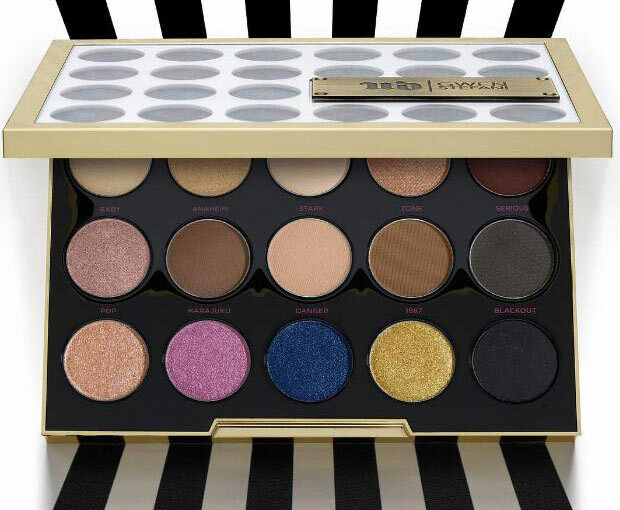 But the new Gwen Stefani eyeshadow palette comprising 15 shades with some sheer effect is featuring a range of warm neutral hues with a couple of smokey-eye-providers in between and in no way dashing our hopes, but on the contrary stimulating us to explore and reveal new sides of Gwen’s go-as-you-please essence. The names of the shades are already known and throwing a look at them you will be able to build the beauty’s whole biography. The Blonde eyeshadow is an overt reference to Gwen’s blonde hair, the Harajuku of purple shade is telling us about Harajuku Lovers fragrance, Anaheim eyeshadow of chocolate brown is informing us about her birthplace, while the stormy grey shade carrying the name Serious is apparently about Gwen’s serious complexion. The rain of colors is housed in a square travel-friendly black-golden case with the name of Gwen Stefani on it, while inside it you will discover a large mirror for your everyday and Christmas touch-ups. What is left to us now is to wait until this magnificent play of colors is launched on November 22 in stores and at Urban Decay’s official website and, of course, until the further sweet fruits of the Urban Decay + Gwen Stefani collaboration are brought to light. First Victoria’s Secret Fashion Show 2015 Costume Revealed!